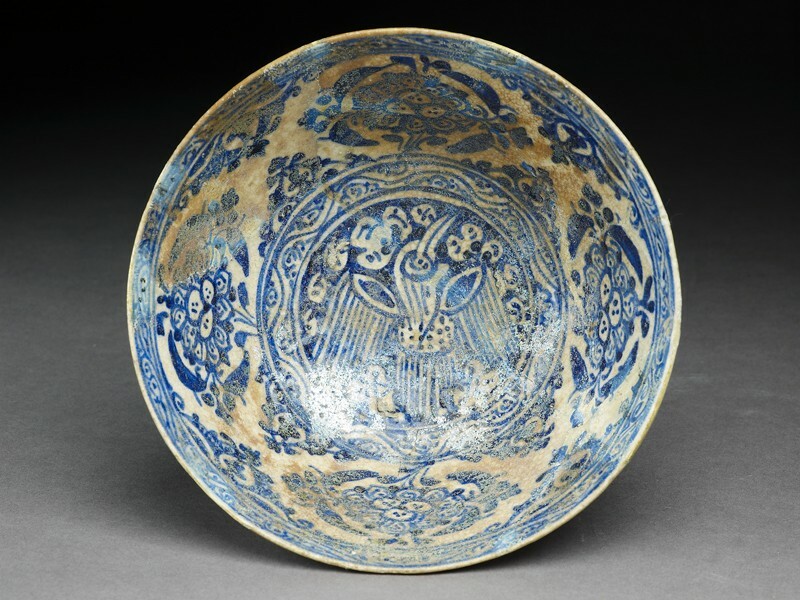 These two bowls [EA1956.114 & EA1978.1593] vividly illustrate the transition between the decorative styles and motifs of fourteenth century Persian ceramics and those current on ceramics produced under the Safavid dynasty in the sixteenth - seventeenth century. The traditional elements are most clearly seen on the second [EA1978.1593], where the design is of a six-pointed star within two other six-pointed stars, the whole framed by a (fragmentary) Persian inscription. The ‘fish-scale’ filler pattern and the trefoils appear to be based on fifteenth century metalwork. The shape, like the colour scheme, however, was introduced into the Islamic world from China in the late fourteenth century, and the decoration on the outside of the rim is a simplified version of a common fourteenth century Chinese border design. In the upper bowl [EA1956.114] the traditional elements are far fewer. The central phoenix continues the ‘Sultanabad’ style illustrated above (no. 19 [EA1956.59]), though even here of course there is a Far Eastern source for the creature. Traditionalism emerges too in the way the whole design forms a circle within a square within a cross-shape, the latter with very wide, round-ended arms: far more geometric in concept than contemporary Chinese designs. But the Chinese elements are otherwise very strong: the peonies, the border patterns, the band of lappets on the outside, the blue and white colour scheme and the shape, all derive from late fourteenth century imports. 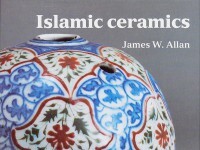 In Iran, from the fifteenth century onwards, the potters had great difficulty withstanding the impact of Chinese blue and white porcelains, though they never completely forgot their Islamic heritage, the latter tradition surfacing at regular intervals alongside the imported motifs and designs (see nos. 36 - 37 [EA1986.50 & EA1978.2169]).